The laid-back and welcoming capital Portland should be your first port of call for your Oregon adventure. Sure, it’s stylish and famed for its hipster credentials, but that trendy edge is teamed with natural beauty that creeps right into the city. So grab a vintage raincoat and a flat white to go, get behind the wheel and open yourself up to some spectacular sights. A 20-minute drive east out of Portland transports you to the mesmerising waterfalls of the Columbia River Gorge. You’ll spy a few from the Columbia River Highway, but it’s worth rolling up your sleeves, double-knotting your shoelaces and heading out on one of the many trails to take in the falls up close – Metlako Falls on Eagle Creek is a particular highlight. 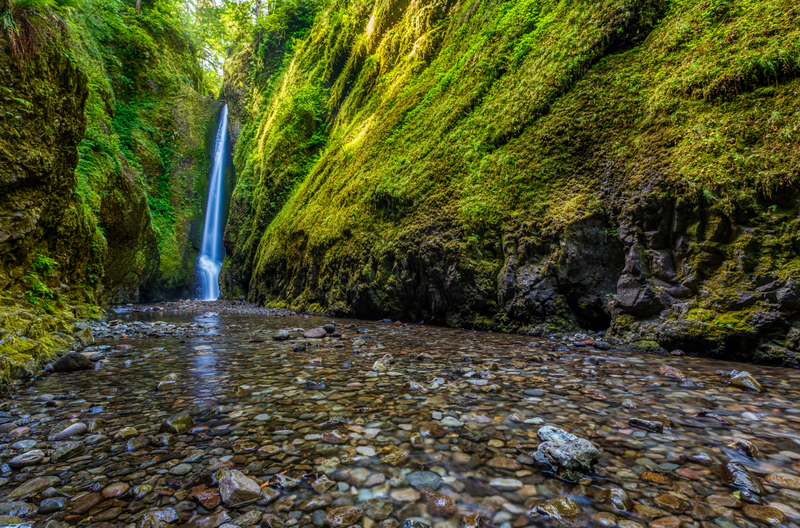 If you’re up for more waterfall chasing, take a detour to Oneonta Gorge. Named by a photographer from Oneonta, New York, this secluded sightseeing spot is draped in glowing green ferns, mosses and lichens, and can be visited in any season. Oregon’s trails are the best places to uncover its undeniable natural beauty – and if you’re staying in Portland, there are a host of great options nearby. Drive an hour east of the city and you’ll find Hood River. Set against the backdrop of the majestic Mount Hood, from here you can walk the Catherine Creek Trail, taking in beautiful wildflowers and sweeping views of the Columbia River. A two-hour drive in the same direction leads you to the Deschutes River Trail. As the sunlight flickers on your face and you feel the ground a little smoother underfoot, you’ll be able to tell the difference between Oregon’s wet and green coast and its contrastingly desert-like inland expanses. If you’re visiting during May and September, you should also check out the mile-and-a-half birdwatching loop of the Kiwa Trail. Kiwa (pronounced ‘kite-wa’) means bent or twisted in the Native American language of Chinuk Wawa. Who was it said a bad day surfing is better than a good day working? If you’re looking to add some action to your adventure, better head to the coast. Ride the waves at Ecola State Park and Short Sands at Oswald West State Park – two beginner surf spots just over 90 minutes’ drive from Portland. And if you’re not quite ready to dip your toes into the water, you can watch others in action at the Rowena Plateau – the perfect vantage point to take in the kitesurfers in the river below. You’ll be sharing your time in the Pacific Northwest with hundreds of other species – and you can take a closer look at the region’s diverse wildlife just a short drive from Portland. 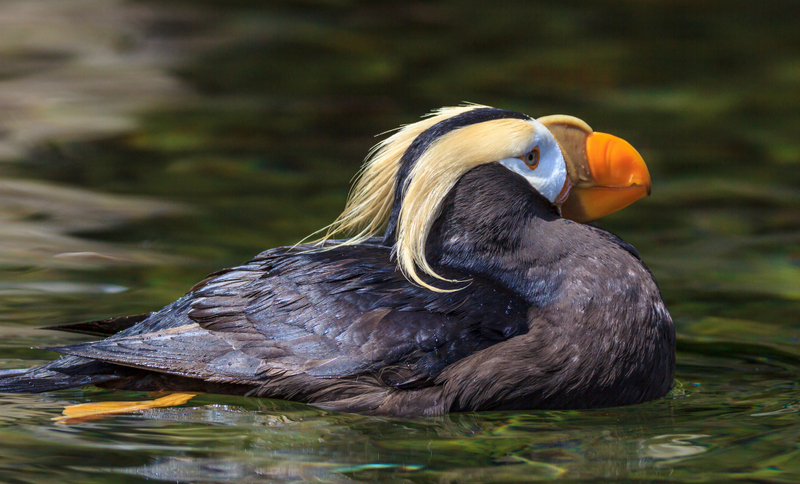 Around 90 minutes outside of the city is Haystack Rock, a huge stone jutting out of Cannon Beach that’s prime territory for spotting the exotic orange-beaked tufted puffin. And don’t put your binoculars away just yet, because you’ll find more birds 45 minutes north of Portland at the Ridgefield National Wildlife Refuge – one of the most important wetlands in the region and known for its diverse range of birds. Equally awe-inspiring is the sight of salmon swimming upriver to spawn on the Columbia River. Get a front-row seat for this epic migration through the underwater viewing windows at the Bonneville Dam, a 45-minute drive east of Portland. It’s like being at an aquarium only better – the fish are wild, and you could spot just about any underwater creature whizzing past. Portland might be famous for its cutting edge culture, but there are so many natural wonders to discover in and around the city. See it all with Hertz car hire in Portland.